Implementing a low-dose CT guided lung biopsy protocol can generate benefits that include reduced variability among practitioners, standardized technique, and ultimately lower doses to patients. Radiologists at the University of California San Francisco (UCSF) described the protocol they developed and what they subsequently achieved in an article published in the September issue of Academic Radiology. CT-guided lung biopsy is an excellent candidate for a low-dose protocol. Images to confirm needle guidance do not need to be of high diagnostic quality and because the repetitive imaging required can sometimes result in high radiation dose to the patient. The protocol adopted by UCSF was developed and implemented by consensus of the attending radiologists in the cardiothoracic section. The protocol allows for flexibility in CT parameters depending upon patient-specific factors and preferences of the attending radiologist. Details of the protocol are specified in the article, but in general, it includes modifications of the kVp, mA, and scan coverage for each of the three phases described below. The majority of the decrease in radiation dose is achieved as a result of decreased exposure parameters, mostly a lower mA. Figure 1. An example of a low-dose biopsy image. The low-dose protocol has three phases: planning, targeting and post-biopsy. The radiologists define the planning phase as the initial CT acquisition with a surface grid in place for lesion localization and selection of a needle path. The targeting phase consists of multiple acquisitions in which the needle is advanced into the lesion and biopsy samples are obtained. The post phase includes images acquired after the needle is removed to determine if the biopsy caused complications. Ideal low-dose parameters were determined for all three phases. To assess and quantify the benefits of implementing a low-dose CT-guided lung biopsy protocol, first author Kimberly G. Kallianos, MD, and her colleagues conducted a retrospective study of all CT-guided lung biopsies performed during a 36-month period: 175 biopsies performed for 18 months using the “standard” protocol and 238 biopsies using the newer low-dose protocol. For each phase of each biopsy, they recorded radiation dose data in the form of dose length product (DLP), total coverage in centimeters, and total number of series. When multiple acquisitions were performed during a single phase, the scan coverage and DLP for each individual acquisition were summed. Additionally, DLP for each biopsy were recorded for each of the six radiologists who performed lung biopsies throughout the duration of the study. The researchers determined that all the radiologists adopted the low-dose protocol and adhered to it consistently after it was implemented. Total biopsy radiation dose decreased an average of 64.4%. Statistically significant dose reductions were achieved in each of the three phases. Reduction was the greatest in the planning phase, by 77.4%, followed by the post-biopsy phase at 65.8%, and the target phase at 52.3%. Data was also collected for each attending radiologist. The authors stated that before the low-dose protocol was implemented, a large range of radiation doses was used by the six attending radiologists, with a difference of 387.9 mGy-cm between the lowest and highest mean doses. After the protocol, this range narrowed to 122.3 mGy-cm. Dramatic dose reduction occurred with two radiologists, with one dropping from a median total DLP of approximately 575 mGy-cm to 200 mGy0cm and the other from approximately 500 mGy-cm to under 100 mGy-cm. For the entire group, the median total DLP remained roughly consistent — between 100 and 175 mGy-cm for the 18 months after the new protocol was implemented. The authors are encouraged by this finding, and believe that the protocol they developed can be successfully implemented in “real world” practices. Kallianos KG, Elicker BM, Henry TS, et al. Instituting a Low-dose CT-guided Lung Biopsy Protocol. Acad Radiol. 2016 23;9:1130-1136. 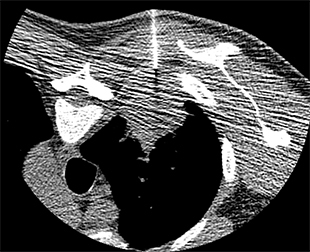 Feasibility and benefits of implementing a low-dose CT-guided lung biopsy protocol. Appl Radiol.